Severe Accident Study? Oops. Not really! ** Cheater alert: even trying to explain this study (& its implications, knowing what I know about CNSC, OPG (Ontario Power Generation) and provincial nuclear emergency planning) is tedious and time-consuming. Near the end of the post there are sections called Summary & Take-Aways. You might be tempted to skip to the end section if all the ins & outs drive you up the wall. It’s hard to know quite where to begin describing this CNSC (Canadian Nuclear Safety Commission) “Study of Consequences of a Hypothetical Severe Nuclear Accident and Effectiveness of Mitigation Measures” report. This severe accident study that is NOT a severe accident study. It all begins to go off the rails quite quickly. You can find the study here. Severe Accident Study. (Request a pdf version &/or a hard copy by writing to info@cnsc-ccsn.gc.ca & requesting one.) ** see note at bottom of post for new (corrected?) version of study. Background: At a CNSC hearing on Darlington in 2012, many groups & individuals – our group, DNA, included – called on the CNSC (Canada’s federal nuclear “regulator”) to carry out a study that would dig into what would happen in the event of a serious nuclear accident at the Darlington Nuclear Generating Station (DNGS). Many of us were very concerned post-Fukushima disaster (which began on March 11/11, just before the Darlington new build EA hearing) that emergency planning measures were/are not sufficient to protect the public of Durham Region (& Toronto/the Greater Toronto Area) in the event of a serious accident here. Given that a severe accident may have consequences beyond the three & 10-kilometre zones evaluated by OPG, the Panel recommends that the Government of Ontario, on an ongoing basis, review the emergency planning zones & the emergency preparedness & response measures, as defined in the Provincial Nuclear Emergency Response Plan (PNERP), to protect human health & safety. After the Darlington 2012 hearing, the CNSC tribunal directed CNSC staff to do a study. Staff did do a study & put it out for public comment (June 2014). Many of us commented (by last August) that the study was clearly not a severe accident study. Greenpeace found out through an Access to Information request that indeed a serious accident (Level 7 on the INES, International Nuclear Event Scale) had been studied, but that what was found was … well, a bit inconvenient to the nuclear industry, shall we just politely say, & was being said (behind closed doors) to be expected to be used “malevolently” at a hearing – so staff were asked to re-do … but with a less severe accident. People in the 3 K “contiguous zone” have already been evacuated. No evacuation beyond 12K would be necessary (this kind of gives away the fact that it’s really not a severe accident, doesn’t it? Compare to Chernobyl & Fukushima realities, with evacuations as far out as 30 K (Chernobyl) & 40 K (Japan, when the plume went northwest instead of southwest, as predicted by computer modelling). The federal government (in the form of the CNSC) is in charge of licensing & supervising operations of the nuke plants. Off-site nuclear emergency planning is a provincial, regional & municipal responsibility (the province is overall in charge; municipalities or regional governments are in charge of carrying out evacuations). There is this sort of eerie, circular thing going on here that I find challenging to articulate. The feds are saying the Province is in charge of mop-up if an accident happens. That the PNERP (Provincial Nuclear Emergency Response Plan) will look after us & help safeguard our health. So this seems to be saying that whatever the Province gets up to with the PNERP (currently under review, behind closed doors, all indications being that there is no plan whatsoever to change the planning basis; my apologies; you may have to read the previous post to really grasp this planning basis business), this study is about this study & does not mean or intend to inform that updating of the PNERP. Isn’t there some kind of painful circular reasoning at work here? 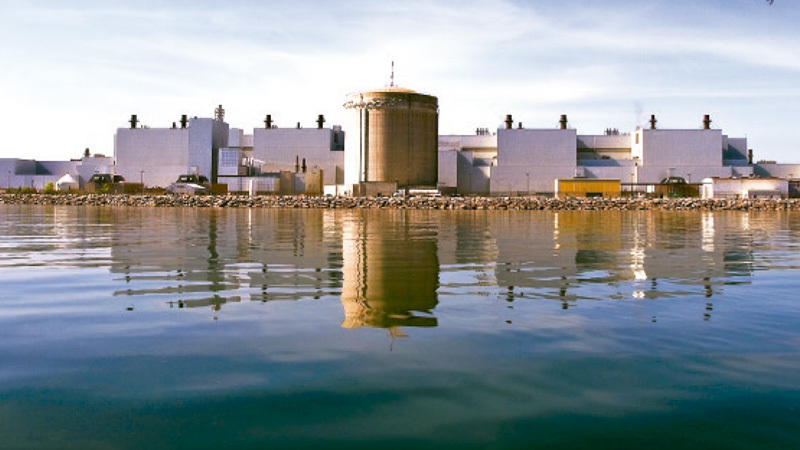 DNA has learned from experience that this provincial nuclear emergency plan review, which we and two other groups called on the Minister for in August 2013, is taking place very much behind closed doors. Prying information out of that Ministry is a chore involving the necessity for endless FOI (Freedom of Information) requests. Anyway. Throughout this (alleged) Severe Accident study, provincial (and regional/municipal) responsibilities are referenced. As I say, it seems a bit eerie the way the feds/nuke operators are counting on the Province to look after Ontarians if the you-know-what hits the fan. Yet the Province is counting on the feds to assist in their planning basis deliberations. Oh dear. I’m getting a bit dizzy here. “Emergency planning is inherently flexible and consideration of sensitive receptors such as children in emergency planning is an integral part of federal and provincial emergency decision making. In the event of an actual accident with this level of predicted risk, decision makers could further mitigate the risk in those areas most likely to be affected through the administration of KI pills or by evacuation. [pg. iii in “Extended executive summary.”] The weirdness of this will become apparent in the Summary/Take-Away sections. When it is revealed that what really seems to be the plan, if a serious accident happens, is to have the Province tell everyone to “shelter in place.” I.e,. stay in your house with the windows & doors closed, people (use some tape maybe, eh?). Now, this comes up a lot! Repeatedly, actually. ** I am pretty sure the citizens of Durham Region/Toronto will be very happy to hear CNSC being so encouraging of wide-open communications. Because in Durham Region, citizens received an emergency brochure in Fall 2012 in which the word “nuclear” was not even mentioned! [AreYouReady] Durham Region residents do not feel they are being openly communicated with. Because they are not. Being openly communicated with. Just saying. Seems like the big nuclear agencies are really big on open communication lines. Well, talking about them, anyway. ** Now we just have to make sure that OFMEM (Office of the Fire Marshall & Emergency Management in the Ontario Ministry of Community Safety & Correctional Services) and DEMO (Durham Emergency Management Office) personnel get the memo! We need to get that review of provincial nuclear emergency plans out from behind those (very) closed doors. The severity of the impacts of the Chernobyl & Fukushima disasters is not only minimized throughout this report, I have to state categorically that there are outright lies about health impacts from these two INES Level 7 nuclear disasters. I suggest readers check the claims made on pg. 65 of the study (link at top of post). These can be immediately identified as pure nonsense. Please also note that even for this non-severe accident study, with all the KI & evacuations conveniently being done before the study kicks in, & all of the assumptions being “conservative,” child thyroid cancer is projected to go up. “Although the results of this study indicate what appears to be a large increase in the risk of incidence of thyroid cancer in children, this would not equate to a large increase in the actual number of thyroid cancers. With rare cancers any additional risk appears to be a large increase above the baseline.” [pg. 60] Two comments: # 1. I can’t make sense out of that. # 2. I call it minimization. In summary, this study has responded to the Commission’s request to evaluate the human health and environmental consequences due to radiation exposure from a severe nuclear accident. The study is of a theoretical nature, using hypothetical severe accident scenarios. Overall, while conclusions point to a non-detectable increased health risk for most of the population, the theoretical increased childhood thyroid cancer risk findings in relatively close proximity to the DNGS further strengthens the continued importance of considering sensitive receptors (i.e., children) in emergency planning, such as KI pill administration. From a risk acceptability perspective, the ability of the PNERP to effectively reduce the health risk, combined with the very low likelihood associated with severe nuclear accidents given Fukushima enhancements (i.e., such an event will be practically eliminated), allows these risks to be effectively managed to an acceptable level in alignment with international risk and radiological frameworks. END QUOTE from study; all underlining is mine. The study is characterized by circular reasoning, faulty logic, contradictory claims & in some cases, outright lies (there are even things I’ve left out because this posting would go on forever. Please read it for yourself & see). But! Open communications about emergency plans are roundly encouraged & emphasized over & over & over again. It still seems eerie the way this circular thing is going on with CNSC relying on the Province, knowing that the Province seems to be relying on the CNSC, and knowing what I know about how the Nuclear Emergency Management Coordinating Committee (NEMCC) operates; namely, behind very closed doors (no minutes provided, even if one has attended one of these meetings, as an NGO person, by invitation) & with heavy attendance from all levels of the nuclear industry itself. Too many fingers in that messy pie (all listed here) to leave me with any confidence in the ability of emergency response to proceed seamlessly if the you-know-what hits the fan (so many cracks for things to fall between, it is almost literally dizzying). The CNSC has tons of faith in the PNERP (Provincial Nuclear Emergency Response Plan) to look after us all in the case of a nuclear accident. In fact, it almost seems to suggest that the emergency plan itself will keep us safe & healthy! Which really doesn't make any sense at all, & seems more than just a little bassackward, but then … whatever. (I think I am repeating myself here. Sorry. This just really boggles my mind). “It can’t happen here” is still very much the mantra of the nuclear industry (previous post explains the history of this assumption, as well as the issue of the planning basis that nuclear emergency plans are … planned around). The nuclear industry pays considerable lip service to the need to communicate openly & ahead of time. Then they throw the ball to provincial “authorities” to do the mop-up & decide on whether to evacuate people or let them rot in their houses. Good lip service about protecting children – but again, toss the football to the provincial authorities to actually do this. It may not be a very good idea to place our trust in the “authorities” to “look after us” if a serious nuclear accident occurs. But then, I doubt you'll be surprised to hear me say this after all of the above. While the nuclear industry pays excellent lip service to the notion of communicating openly, I am very skeptical about these claims. But let’s the rest of us communicate openly, shall we? Let’s speak up! Reports like this one from the nuclear industry are time-consuming & headache-inducing to spend time on – but you know what? They are NOT rocket science, & anyone with a reasonable level of intelligence is quite capable of reading & making sense of them. No, I’m not saying they're enjoyable; they make my head hurt. But I can read between the lines, & we all need to be able to do that … don’t we? 1 more thing: get this! I read the Fukushima – the story of a nuclear disaster book again this summer. Mind-blower of a book, that’s the truth (posting about it here). Guess what TEPCO (the utility that owns/runs the Fukushima plant & believe it or not, is doing fine financially even though the costs of the accident are probably in the process of bankrupting the country?) said at one point? They blamed the nuclear regulator for not regulating them! I think we ought to keep this in mind here. Our “regulator” here is not really regulating either. And our provincial authorities seem to be fine with this. This could lead to some catastrophic results. Which maybe they will blame on us, for not paying close enough attention; who knows? Collusion among nuclear industry/regulators/government departments is not only a Japanese phenomenon; not at all. It is a global problem, & frankly, it is in evidence right here in Durham Region / Ontario / Canada. So sorry to be the bearer of uncomfortable news, dear Reader. They do say the truth will set us free. 4 common elements to Three Mile Island, Chernobyl, Fukushima accidents (that link provides 18 minute video/audio; this one 4 Lessons from Nuke Accidents provides the powerpoint presentation by a person who worked for the nuke industry at TMI (Three Mile Island accident time). can we trust this severe accident study?, circular reasoning in CNSC study, faulty assumptions in CNSC study, living in the secondary zone, not a severe accident study, nuclear plants are safe, recent DNA postings, sheltering in a nuclear accident, sheltering in place, TEPCO blamed regulator for not regulating!, thyroid information, Torontonians in the secondary zone, we live in the secondary zone, whoa; really?